Welcome to the Wootric API documentation! You can use our API to access and update your end users, responses and declines. All responses from the API (including errors) are in JSON. All code examples are in cURL. Access tokens can be retrieved using either grant_type of password with your account email and password, or grant_type of client_credentials with your application client_id and client_secret. Access tokens expire 2 hours after creation. New access_token can be obtained using refresh tokens as detailed in the cURL example to the right. You must replace myaccesstoken with your personal Access Token. Never send your credentials (password or client_secret) as query parameter to URL even when using POST request. Query parameters get logged in plain text as your API requests hop through different servers on the way to Wootric servers and hence it can be exploited. $ curl -I -s -H "Authorization: Bearer <youraccesstoken>" -X GET "https://api.wootric.com/v1/end_users"
We recently introduced usage limits to some of our API endpoints, which only allow for a certain number of requests within a minute. When that limit is reached, the API starts responding with HTTP status 429 and the client is only allowed to continue querying the API after a minute has passed. To find out if the endpoints you’re using are affected by these limits and how many requests you’re allowed to perform within a minute, check the X-Rate-Limit-* headers included in each API response (see below). If you can’t find these headers it means that the endpoint is not limited. X-Rate-Limit-Limit The maximum number of requests that the client can perform on this account within a minute. X-Rate-Limit-Remaining The number of remaining requests. X-Rate-Limit-Reset A timestamp indicating when the counter will be reset. If you find that the current rate limit on your account is too low for your needs, please contacts us. curl -H "Authorization: Bearer myaccesstoken" "https://api.wootric.com/v1/end_users"
This endpoint retrieves all end users. Scope parameters filter your end users and can also be chained together by passing multiple scope parameters in an array. We recommend to iterate using created parameter if you need to get more data than what you get out of our pagination restriction. curl -H "Authorization: Bearer myaccesstoken" "https://api.wootric.com/v1/end_users/2"
This endpoint retrieves a specific end user by id. curl -H "Authorization: Bearer myaccesstoken" "https://api.wootric.com/v1/end_users/nps2@example.com"
This endpoint retrieves a specific end user by email. curl -H "Authorization: Bearer myaccesstoken" "https://api.wootric.com/v1/end_users/phone_number/+14155554131"
This endpoint retrieves a specific end user by phone number. phone_number The Phone Number of the end user to retrieve. The phone number must be prefixed with ‘+’. If it’s just digits, it will look up by id. curl -X POST "https://api.wootric.com/v1/end_users?access_token=myaccesstoken" -d "email=enduser@example.com&last_surveyed=1423732280&properties[company]=TestCompany&properties[city]=San Francisco"
curl -X POST -H "Authorization: Bearer myaccesstoken" "https://api.wootric.com/v1/end_users" -d "email=enduser@example.com&last_surveyed=1423732280&properties[company]=TestCompany&properties[city]=San Francisco"
This endpoint creates the end user. curl -X PUT "https://api.wootric.com/v1/end_users/1?access_token=myaccesstoken" -d "email=enduser_new@example.com&properties[company]=NewCompany&properties[city]=New Reno"
curl -X PUT -H "Authorization: Bearer myaccesstoken" "https://api.wootric.com/v1/end_users/1" -d "email=enduser_new@example.com&properties[company]=NewCompany&properties[city]=New Reno"
This endpoint updates the end user with specified params. curl -X DELETE -H "Authorization: Bearer myaccesstoken" "https://api.wootric.com/v1/end_users/1"
curl -X DELETE -H "Authorization: Bearer myaccesstoken" "https://api.wootric.com/v1/end_users/user@domain.com"
This endpoint marks the end user for deletion. Deletion would be performed the following day at 7 AM UTC. curl -H "Authorization: Bearer myaccesstoken" "https://api.wootric.com/v1/end_users/2/export"
This endpoint schedules an export to be processed for the given end user ID, when the export file is ready we’ll send you an email with a link to the final JSON export file. curl -H "Authorization: Bearer myaccesstoken" "https://api.wootric.com/v1/responses"
This endpoint retrieves all responses for a user. Scope parameters filter your responses and can also be chained together by passing multiple scope parameters in an array. curl -H "Authorization: Bearer myaccesstoken" "https://api.wootric.com/v1/end_users/1/responses"
This endpoint retrieves all responses for end user. curl -H "Authorization: Bearer myaccesstoken" "https://api.wootric.com/v1/end_users/1/responses/promoters"
This endpoint retrieves all promoters responses for end user. Scope parameters filter your promoters responses and can also be chained together by passing multiple scope parameters in an array. curl -H "Authorization: Bearer myaccesstoken" "https://api.wootric.com/v1/end_users/1/responses/passives"
This endpoint retrieves all passives responses for end user. Scope parameters filter your passives responses and can also be chained together by passing multiple scope parameters in an array. curl -H "Authorization: Bearer myaccesstoken" "https://api.wootric.com/v1/end_users/1/responses/detractors"
This endpoint retrieves all detractors responses for end user. Scope parameters filter your detractors responses and can also be chained together by passing multiple scope parameters in an array. curl -H "Authorization: Bearer myaccesstoken" "https://api.wootric.com/v1/end_users/2/responses/2"
This endpoint retrieves a specific response. curl -X POST "https://api.wootric.com/v1/end_users/1/responses?access_token=myaccesstoken" -d "score=5&text=test response&ip_address=192.168.0.1&origin_url=http://example.com"
curl -X POST -H "Authorization: Bearer myaccesstoken" "https://api.wootric.com/v1/end_users/1/responses" -d "score=5&text=test response&ip_address=192.168.0.1&origin_url=http://example.com"
This endpoint creates a response for the end user. end_user.properties (optional) hash An object containing the current properties for this end user. If supplied, the end user profile will be updated and the new properties will be associated to this response. curl -X PUT "https://api.wootric.com/v1/responses/1?access_token=myaccesstoken" -d "completed=true&excluded_from_calculations=false"
curl -X PUT -H "Authorization: Bearer myaccesstoken" "https://api.wootric.com/v1/responses/1" -d "completed=true&excluded_from_calculations=false"
The above command returns and empty response with status 204. This endpoint updates an existing response. end_user.properties (optional) hash An object containing the new set of properties for this response. This will only update the properties that the end user had at this point in time. The current end user properties won’t be updated. Since this feature allows to edit historical data, it’s not enabled by default. Please contact us to enable it. A 423 error will be returned when attempting to use this feature if it’s not enabled. curl -X DELETE -H "Authorization: Bearer myaccesstoken" "https://api.wootric.com/v1/end_users/1/responses/1"
This endpoint deletes an end user response. curl -H "Authorization: Bearer myaccesstoken" "https://api.wootric.com/v1/declines"
This endpoint retrieves all declines for the user. Scope parameters filter your declines and can also be chained together by passing multiple scope parameters in an array. curl -H "Authorization: Bearer myaccesstoken" "https://api.wootric.com/v1/end_users/1/declines"
This endpoint retrieves all declines for end user. curl -H "Authorization: Bearer myaccesstoken" "https://api.wootric.com/v1/end_users/1/declines/1"
This endpoint retrieves a specific decline. curl -X POST -H "Authorization: Bearer myaccesstoken" "https://api.wootric.com/v1/end_users/1/declines"
This endpoint creates a decline for the end user. end_user.properties (optional) hash An object containing the current properties for this end user. If supplied, the end user profile will be updated and the new properties will be associated to this decline. curl -X PUT "https://api.wootric.com/v1/declines/1?access_token=myaccesstoken" -d "end_user[properties][persona]=Individual"
curl -X PUT -H "Authorization: Bearer myaccesstoken" "https://api.wootric.com/v1/declines/1" -d "end_user[properties][persona]=Individual"
This endpoint updates an existing decline. end_user.properties (optional) hash An object containing the new set of properties for this decline. This will only update the properties that the end user had at this point in time. The current end user properties won’t be updated. Since this feature allows to edit historical data, it’s not enabled by default. Please contact us to enable it. A 423 error will be returned when attempting to use this feature if it’s not enabled. curl -X DELETE -H "Authorization: Bearer myaccesstoken" "https://api.wootric.com/v1/end_users/1/declines/1"
This endpoint deletes a decline for the end user. curl -H "Authorization: Bearer myaccesstoken" "https://api.wootric.com/v1/end_users/1/settings"
This endpoint retrieves a specific end users settings. curl -X PUT "https://api.wootric.com/v1/end_users/1/settings?access_token=myaccesstoken" -d "email_nps=false&force_web_survey=true"
curl -X PUT -H "Authorization: Bearer myaccesstoken" "https://api.wootric.com/v1/end_users/1/settings" -d "email_nps=false&force_web_survey=true"
This endpoint updates the end users settings with specified params. curl -H "Authorization: Bearer myaccesstoken" "https://api.wootric.com/v1/nps_summary"
curl -H "Authorization: Bearer myaccesstoken" "https://api.wootric.com/v1/nps_summary?date%5Bstart%5D='YYYY-MM-DD'&date%5Bend%5D='YYYY-MM-DD'"
This endpoint retrieves the NPS summary for the specified date range. If no date range is specified, the API returns NPS summary for the last month. The values returned by this endpoint depend on the Account’s time zone setting. curl -H "Authorization: Bearer myaccesstoken" "https://api.wootric.com/v1/segments"
This endpoint retrieves all segments for an account. 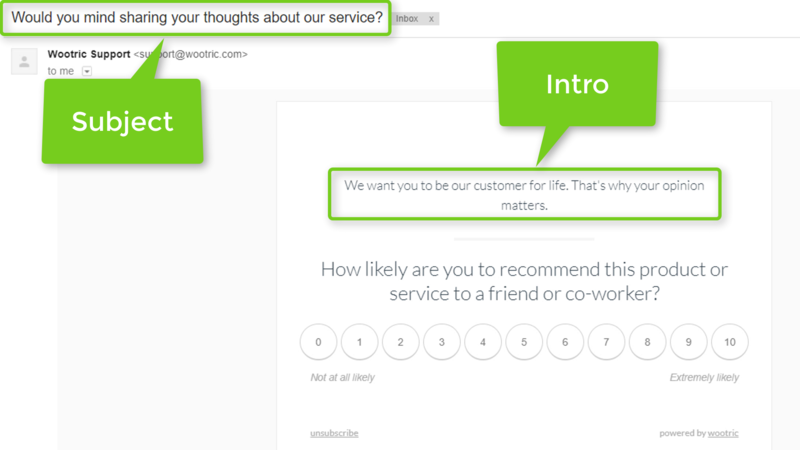 -d "intro=We want you to be our customer for life. That's why your opinion matters." Maximum of 100 emails per request. We will automatically create an end user if they don’t exist. delay Integer Days we will wait before sending the survey. Delay is optional and it must be between 1 and 31 days. # Example of sampling override. You may use these parameters to overwrite the settings you have in your Wootric settings panel.